Let me remind you of the patient we had in part 1 of this blog. The patient had presented in rapid atrial fibrillation at a rate of 170-180. His BP was about 60mmHg systolic. Cardioversion was attempted( x 3) with Metaraminol used to support blood pressure, however it was unsuccessful. An Amiodarone infusion was commenced and we needed to start an inotrope to support the blood pressure, until the Amiodarone worked. The question posed is, what inotrope to use? Adrenaline, NorArdrenaline, Dopamine or Dobutamine? My suggestion is NorAdrenaline. After having asked several physicians, most agreed, but some would have used Adrenaline. What would you use? What am I trying to achieve and what don’t I want? In this unstable AF patient, I want to maintain a good blood pressure, but don’t want to counteract the effects of the amiodarone, i.e.., I don’t want to increase the heart rate. Adrenaline, at low doses, has a more pronounced β effect. So a positive chronotrope and inotrope. At higher doses the α effect becomes more pronounced. So adrenaline may increase the heart rate. Our patient is already going at over 170, in terms of ventricular response. I don’t want to raise that rate any higher as it may result in decreased ventricular filling, decreased diastolic time with a result of lower cardiac output and decreased coronary blood flow. NorAdrenaline is a potent α agonist and a modest β agonist and thus has minimal chronotropic effect. Perhaps a better drug to use. Lets see. The agent I’m looking for will help me to maximise the stroke volume. 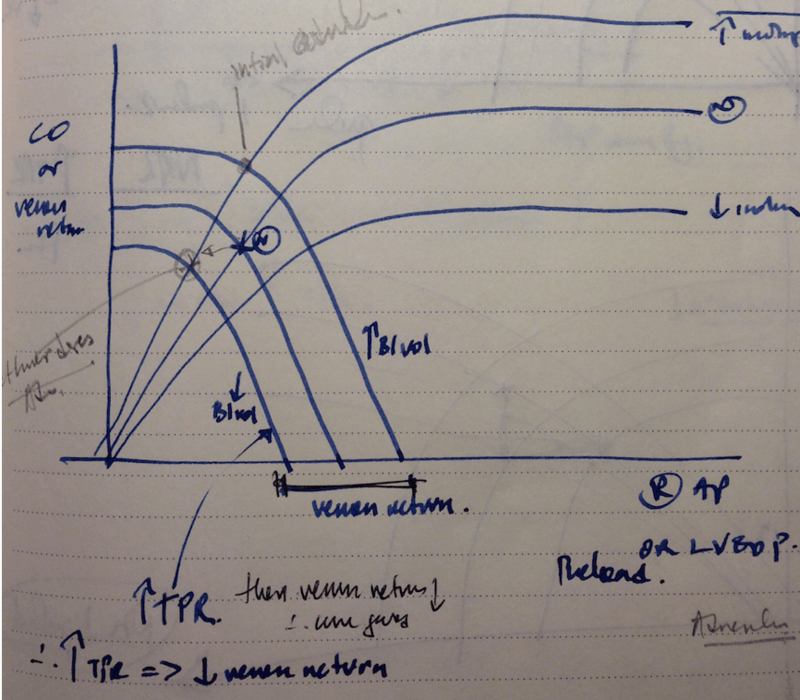 Stroke volume is affected by 3 things: Contractility, preload and after load. If we increase the contractility, more blood is pumped out. If we increase the preload, then there is more stretch resulting in greater contractility(as per Frank Starling curves (shown) but only to a point, after which too much stretch results in decreased cardiac output. If the after load is increased, then there may be more volume in the left ventricle, leading to greater stretch and thus more contractility, again until a point is reached and there is too much peripheral resistance for the heart to pump against, at which point the stroke volume decreases. Another potential drug to use is Dobutamine, which is a potent inotrope, weaker chronotrope and it does significantly increases myocardial oxygen consumption. Now I don’t know the cause of the atrial fibrillation here, so I’m staying away from it, just in case ischaemia is the cause, otherwise it has some good properties. Dopamine like Dobutamine, increased myocardial oxygen demand so I’ve decided not to use it. Also at more than small doses, Dobutamine starts to resemble NorAdrenaline. The result, is gentle balancing act, especially given that we have no feedback of cardiac output or systemic vascular resistance in the emergency department. 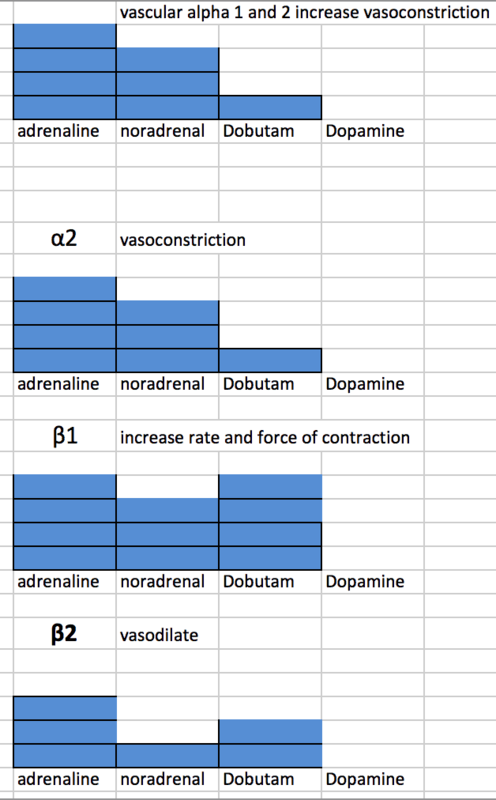 So let’s look at the effects of Adrenaline and Noradrenaline. Noradrenaline increases the mean arterial pressure and everything else, in a way that is appropriate, but doesn’t increase the heart rate. My approach in this patient, is to start some Noradrenaline first and give the amiodarone time to work. The increased peripheral resistance will maximise the potential stoke volume, potentially resulting in an increased BP. The key is to start it and optimise the BP with it. Greater support may be required and at some point, adrenaline may need to be used. We need to be careful that we don’t cause excessive vasoconstriction in the patient. Now I note that I haven’t spoken about digoxin in this patient. The reason for this, is the time it takes for digoxin to work(hours) and the fact that we need something potent right now. Also a less pressing issue but nevertheless real one is the risk of bradycardia, once the amiodarone(long half life) has started working and there is also a large dose of digoxin kicking in. What would you use and why? Email me at peter@resus.com.au and let me know. At low dose: β effect more pronounced. So a positive chronotrope and inotrope. At high dose : α effect more pronounced. Potent α agonist and modest β agonist. Has minimal chronotropic effect- makes it attractive in tachycardia. It increases systolic, diastolic and pulse pressure. Does it have an overall effect on cardiac output? It increased coronary blood flow due to an increase in diastole. It’s used in shock secondary to vasodilatation and cardiac causes. Has affinity for β1 and β2 receptors at a 3:1 ratio. Potent inotrope, weaker chronotrope. Significantly increases myocardial oxygen consumption. At low doses (< 5mcg/kg/min) there is both β1 β2 α1 agonist and antagonist effect as well as β1 β2 α1 stimulation, with the net effect being mild vasodilatation. At 5-15mcg/kg/min there is increased cardiac contractility but no effect on peripheral resistance. At higher doses i.e. > 15mcg/kg/min it causes vasoconstriction. It is used at low doses for decompensated cardiac failure and cardiogenic shock. Its use extends to sepsis induced myocardial dysfunction and symptomatic bradycardia. At low doses (0.5-3mcg/kg/min) may have vasodilatory effects: the controversial renal dose of dopamine. At intermediate doses (3-10 mcg/kg/min) weakly binds to β1 receptors causing endogenous noradreneline release. At high doses (10-20mcg/kg/min) there is α1 mediated vasoconstriction. This indicates that dopamine can be used for shock(vasodilatory and cardiogenic, for congestive cardiac failure and symptomatic bradycardia. I would use a NorAdrenaline in this case. Does it have an overall effect on cardiac output? – YES – rises in SVR are associated with increases in cardiac contractility – this is Anrep effect.